In a pan I melted 3 Tablespoons of butter first. A note here, I don’t believe margarine will produce the same results, although probably still edible. But if you want to WOW them, I’d suggest real butter here! When the butter was melted I added about 4 cups of mini marshmallows and stirred on medium heat until everything was all melty. I’d already measured my crisped rice cereal and had it waiting in a large metal bowl. I dumped the melted marshmallow mixture in & quickly folded it all until the cereal was coated. I tossed in a handful of chocolate chips too. But the chocolate semi-melted with the hot marshmallow mixture. So I may or may not skip stirring chocolate chips into the mixture in the future. Then I tossed the whole shebangie into a 9×13 pan and used some waxed paper to press it all firmly into place. Keep in mind that after the marshmallow mixture is added, the steps that follow need to be done pretty quickly. The melted marshmallow is easy to work with when it’s hot. But as it cools things get thicker and harder to work with. Now here’s where things get interesting. I sprinkled the chocolate chips on top and placed the Rice Krispie pan into a warm (yet turned off) oven to get the chocolate to melt on top. When the chips were shiny I brought the pan back out. Using a spatula I spread the melted chocolate over the top of the Rice Krispie treats. I placed the pan into the refrigerator for about 30 minutes. Just long enough to set the chocolate. Then I brought it back out of the fridge and prepared to cut it into individual treats. RancherMan was buzzing in the background waiting for that first taste! It was delicious and RancherMan simply raved. Now folks, it really doesn’t get any easier than this! As I said, I found the original recipe on the Rice Krispie Website. But the recipe below is as I made it. In a saucepan melt butter slowly over low heat. Add marshmallows and stir until completely melted. (hint - heat slowly & JUST until melted - don't overheat!) Remove pan from heat. Measure cereal into large bowl. Add marshmallow mixture & stir until well coated. Transfer cereal mixture to a 13"x9" pan. Use wax paper to firmly press mixture evenly. Sprinkle chocolate chips evenly over top of pressed cereal. Place pan of Rice Krispie Treats in a warmed oven (turned on for 1 minute only to warm & then turn off before adding the pan). Allow chocolate to melt & become soft, about 5 minutes. 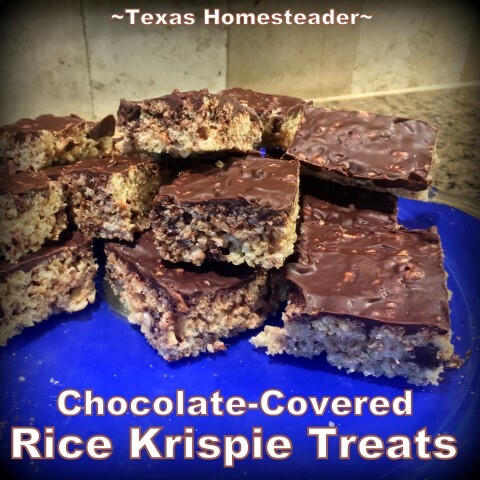 When chocolate chips are shiny, remove from oven and spread chocolate evenly over surface of Rice Krispie Treats. Cool in refrigerator for 30 minutes to set the chocolate. Then cut into individual treats. MICROWAVE DIRECTIONS: In microwave-safe bowl heat butter and marshmallows on HIGH for 1 minute. Stir & repeat, heating for 1 minute & then stirring until marshmallows are melted and mixture is smooth. (Microwave cooking times may vary.) Then proceed with the recipe. I always made scotcheroos for the potlucks we had at the church. You may not remember them. But they take peanut butter, corn syrup and sugar, then they get iced with melted butterscotch and chocolate chips. And they go really fast. I always have that stuff on hand for a quick and easy potluck dish. The only thing I might need to buy is the rice Krispies. When I made them for the church I always had to make a second batch if I didn’t come home with leftovers. Tammy, I really don’t measure. I just take a couple a spoons full ( roughly 1/4 of a cup; give or take a little)to 1 pkg of chocolate chips and that’s using a 9×13 cake pan or baking sheet for my treats. Peanut butter just gives it a nice extra flavor. for hubby, I Have to add some peanut butter when melting my chocolate chips. He doesn’t really like them plain but he sure does devour them with the peanut butter and melted chocolate on top.